My mood lifts considerably when the cerulean sky outlines an especially bright cloud or bushy green tree. Such a simple remedy, but I forget to take note of its unyielding powers. Elisa Soliven's combination of pinks, blues and reds have a similar effect on my state of mind, as does spending time with her family. When I came to visit last month, Emil, her delightful second boy of just two months, sat with us for the afternoon along with her Husband and studio mate JJ Manford. Elisa was preparing for her solo show, open now at Sunday Takeout. Her foot gently rocked Emil in his bassinet while her hands engraved a repeated image of me drawing into a large slab of clay. JJ would pick up Emil occasionally to give him a bounce and a burp and then continued working on his paintings. Whenever I consider what keeps me going as an artist, it's days like this that give me an answer. 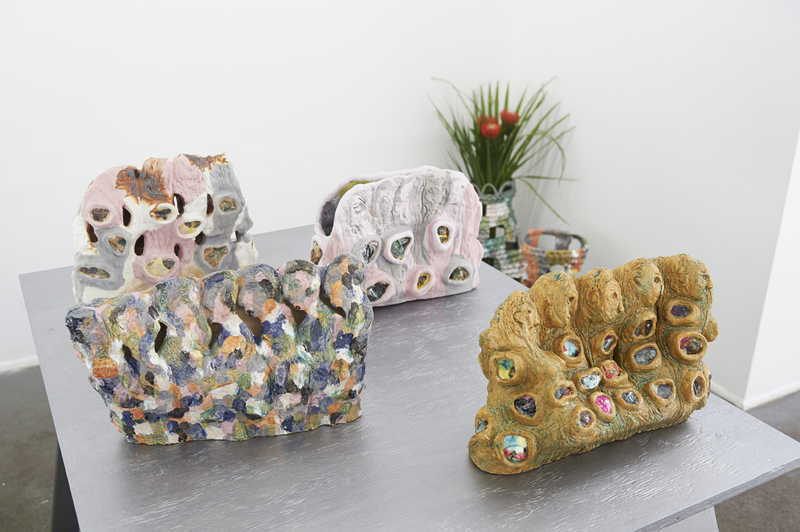 Multi-colored mounds emerge out of the glistening slabs that lay across Elisa's studio floor. A Turquoise glaze nestles into their coarse crevasses like cool ocean water. The brightly colored porcelain pieces that she embeds in the slabs play the role of coquina shells catching their breath after each receding wave. Her sculptures are as gloriously individual as the shells and stones found on a bubbling shorelines. The consistency of Elisa's palette is the constant thread in the three dimensional manifestation of her invented reality, each body of work seamlessly related to the next. 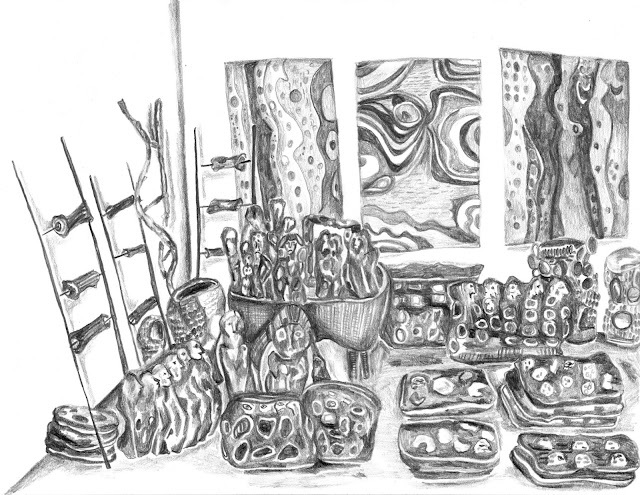 On a table against her studio wall, she has arranged a crew of lively ceramic commedia dell'arte characters. One, she has attached to its own proscenium, ready for performance. Below that, an upright hunk of clay repeats the shape of a torso in motion. Its metallic glaze catches the light from the window, making its figure with many faces fracture like a cubist painting. Leaning against the walls iron ladders are beautifully corroded with patterned bone-shaped cylinders. Soliven's studio reads like a room full of extraordinary artifacts, she has created a kind of archeology museum out of her own imagination. It was a wonderful way to spend an early summer day. We ate falafel and laughed at stories of our shared experiences over the years. The breeze came in and out of the window and eventually my paper filled up with the joyfulness of Elisa's sculptures. 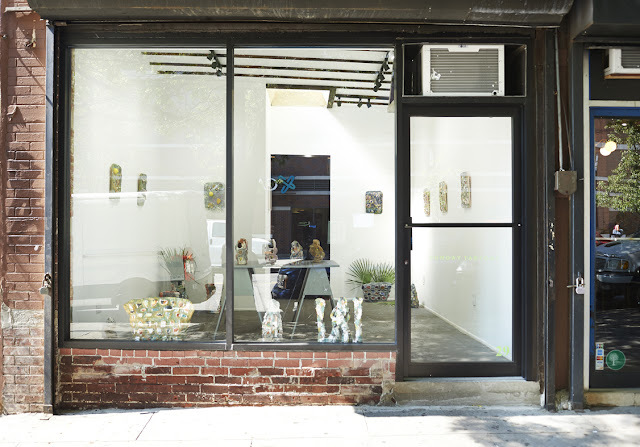 Be sure to see her solo show "Gathering Gravity Grows Gray" open now at Sunday Takeout. 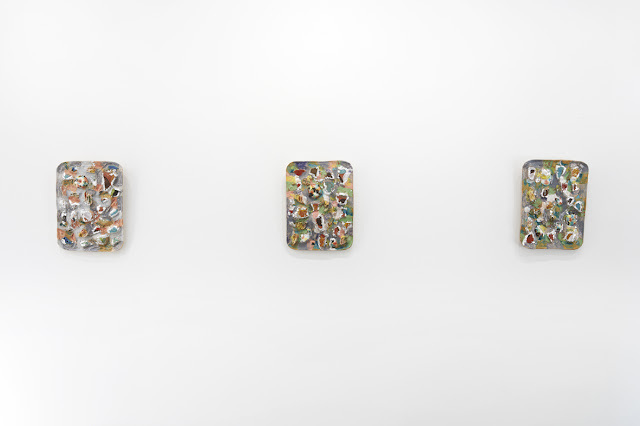 She is also in "Figured Out" at Andrew Rafacz Gallery in Chicago and "Fantastic Plastic" curated by Jaqueline Cedar with Crush Curatorial. In July, Elisa will be a part of the Jay Invitational of Clay in the Adirondacks that Jason Andrew curates every year in Jay, NY. To see more of her work go here: http://elisasoliven.net/.